RMHC Latvia is bringing healthcare to children in Latvia that normally have no or difficult access to specialist doctors. They drive their Care Mobile, a truck with two treatment rooms and state-of-the-art equipment, to places like Liepaja, Saldus, Tukums and Daugavpils, where specialists from the state children’s hospital see the local children. And they’ve been doing so for 2 years now. This year alone, more than 2500 children have visited the Care Mobile to see a doctor. Strangely, the great work RMHC Latvia is doing, is a well kept secret in Latvia. 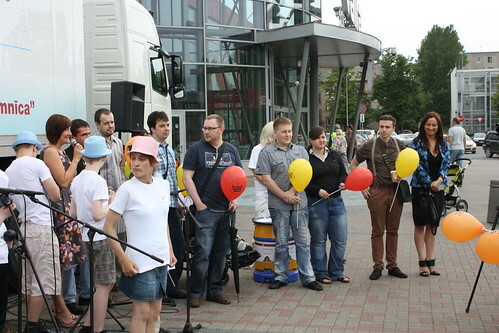 Celebrating the second ‘birthday’ of the Care Mobile is a good moment to start telling Latvia about it. In collaboration with 77Agency, a mobile app was developed to help RMHC Latvia to spread the word about their work. It’s the first mobile app for charity that is developed in Latvia especially for the Latvian market. With it, people can learn more about the organisation, donate to it via SMS and share check-ins to selected locations with their friends on Facebook. To do this, special stickers with QR codes were developed and have been placed at doors and donation boxes in Linstow shopping malls, McDonalds restaurants, Olympic Casinos and Radisson Blu hotels in Riga. The app is a good example of how social media, mobile technology and real-life events are coming together. It allows users to share their life events with their friends, and support a good cause while doing so. Plus, it’s fun and easy to use. As a board member of RMHC Latvia, I was privileged to be very close to the development of this app, and it was amazing to see the enthusiasm and energy the team at 77Agency put in to developing it. And all simply for a good cause, because the app was donated by the agency to RMHC Latvia. The app is available for both Android phones and iPhones, and can be downloaded at www.caremobile.lv/mobile. Get it and start finding those QR-code stickers! Events these days are typical moments to go all out on social media, or rather social technology. Whether it is a film festival or a marathon, using social technologies can create an enormous buzz around your event. This, of course, might contribute to making it successful this time, but the impact might be even better visible the next time around. As an example, let’s take the Nordea Riga Marathon that was held last weekend. Of course, there was a special twitter account, a Facebook page, presence on Draugiem. But there was more. Important locations for the event (the Expo in hotel Latvia, the start and finish line) where added to Foursquare. Then, there was the opportunity for people to follow their favorite runners (often friends or spouses) and send them a personal message which would be displayed on screens along the route. Using all these moment that people want to share, to enable people to share does not only ensure a lot of exposure of your event, but it will also make people feel more connected to it. The participants, but also their friends. This connectedness will give you a good start for making the event even bigger and better next time. The organisation of the Nordea Riga Marathon really understands this, and they even have opportunity to make more use of the technology that is already in use. The RFID chips, or bibs, used in the runners numbers for time measurement, can easily be connected to Foursquare and Facebook for automatic check-ins at start and finish. And how about automated check-ins at locations of interest along the route, such as the Vansu bridge or Riga’s Old Town, combined with the check-points for time measurement. What is important when using social technology for event marketing, is to find those moments that people want to share, enable them to share these (with their permission, of course), see what technology you are already using and how you can put turn that into social sharing technology, and last but not least: ensuring that you collect data about all this social activity, so that you can use that to measure the impact this has on your event. Maybe this makes it easier to find sponsors, maybe there will be more people signing up next year, maybe you can sell more merchandising. But if you don’t measure, you will never know. Without this kind of information, it will be hard to decide where to focus your resources. And don’t forget: you are not only aiming to promote the current edition of the event, but also future editions. This post is an expansion of my monthly contribution to the newsletter of the American Chamber of Commerce in Latvia. One of my favorite marketing videos on YouTube is the one in which an airline shows how they surprise their passengers on a Christmas Eve flight. When the passengers are waiting for their luggage, presents appear on the belt. One for each. The official version of the video is viewed more than 100.000 times and it has given them a lot of attention in several media. A great move: people like surprises, which means customers are pleased. They also like to share about it. On top of that, many potential passengers have seen this video, and it may have well been their introduction to the brand. As it was for me. If a video like this is your first encounter with a brand, it’s bound to make a favorable impression, and you remember it with fondness. Exactly what marketers would hope to achieve, because the theory goes that next time I book a flight, I will be considering this airline more than others. So far, so good. Brilliant social media marketing. What else can go wrong, right? Well, the airline in question is called Spanair. The video was shot in 2010, and made waves in the beginning of 2011. In that same year, Spanair recorded losses of 150 million euros. Last week they announced bankruptcy and suddenly and immediately ceased operations, leaving many passengers stranded. It’s very sad for the employees of Spanair, the stranded passengers. But it also shows something about social media marketing. The campaign around the unexpected luggage could be considered as a success, but in the end, that did not mean that the company was able to attract enough passengers. If you don’t have your business in order, even millions of views on YouTube and enormous amounts of positive media attention cannot save you. The success of the campaign can only be measured by a result that matters: survival of the company. Clearly, it wasn’t that successful. Having said all that, I still love the video. Here it is. Somehow, despite all the great examples of social media marketing out there, there are still many companies that have heard of it, and then go about it absolutely the wrong way. In this How-not-to case study a nice example of misunderstood permission marketing. You know all these website that ask you to register and where you have to leave your email address, right? Well, there’s always a checkbox on these site where you can indicate whether or not you’re open to receive offers from the company in question, or their partners. This is where you give them permission to send you emails. In other versions, there’s a message about this hidden in the terms of service, but that is already a bit old school. So, permission marketing is about customers giving companies permission to send them offers and advertising by email. What permission marketing is not, is that you get a customers email address from a third party and see that as permission to send advertising to that customer. In many countries, there’s even legislation that prohibits both: distributing the email addresses and sending unsolicited emails. Every now and then, a CEO makes some waves by planning to ban email from his company. And it’s not only in young tech start-ups. This time it’s Mr Thierry Breton, CEO of Atos, a global IT consulting outfit of over 80.000 employees. In 18 months, email will be phased out in the company, or at least, that is Mr Bretons plan. Obviously, this is very exciting news, and a bold move. Especially if you either love or hate social media. And I think he has a point. Many people know the annoyances of a full inbox waiting after vacations, the weekend or a business trip. Many people, especially those with smart phones, go through their emails in other places than the workplace, and at other times than ‘normal’ working hours. Almost everybody knows the long email threads, sent to different people, replying to all, adding more and more recipients, and including the previous conversation. Oh, and then there is that one person in the company who is not in the loop, but should have been. Or answers to earlier messages in the thread, that have already been resolved. Or full mailboxes due to large presentations or other documents in multiple versions being mailed around.